Feast your eyes on these exquisitely intricate artworks! Avos may just be the best thing since sliced bread (or rather, the best thing on sliced bread) -- but's that not all they can be used for! If you thought avocado lattes were taking the avo craze way too far then this new trend will leave you mind-blown. Avo art, anyone? Read more: Calling all avocado-lovers: Avolattes are a thing! 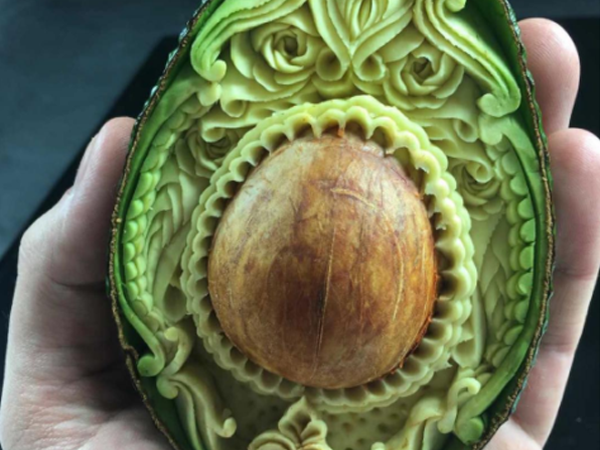 Avo art pieces have been showing up on Instagram feeds all over the show and people can't get enough. Pictures of the yummy green fruit open and intricately carved into beautiful patterns have been snapped by artists who saw the superfood as just another canvas for their creativity. According to Artnet, the trend was started by Italian artist Daniele Barresi. Unfortunately, pieces like Daniel's -- which took an hour to carve -- won't last very long, as the avo will soon start to brown. This photo has got billions of views ? The softest cocoon ? (back in the womb) • I will be offering new works for sale tomorrow, Friday 9th June at 7pm Irish time (24 hours from now) ? you can preview the new listings in my website shop now - link in bio ? and what would this list be without some creative avo on toast action!